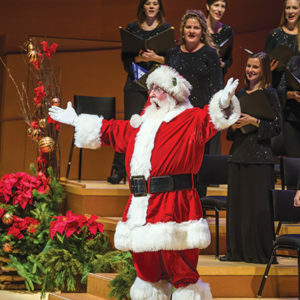 The Los Angeles Master Chorale will perform five festive Christmas concerts in Walt Disney Concert Hall in December, beginning with the new “English Cathedral Christmas” program on Dec. 2 at 7 p.m. that will showcase the tradition of British carols and anthems with works by a range of composers from the 16th century to today. The other performances include the popular Festival of Carols on Dec. 8 and 15 at 2 p.m., Handel’s “Messiah” on Dec. 16 at 7 p.m. and the 38th annual Messiah Sing-Along on Dec. 17 at 7:30 p.m. when the 2,200-strong audience sings as the chorus. All concerts will be conducted by Grant Gershon, the Master Chorale’s Kiki & David Gindler artistic director. The two performances will also feature works by Shawn Kirchner, a longtime tenor in the Master Chorale and former composer-in-residence. Children under the age of six will not be admitted to Los Angeles Master Chorale concerts. Tickets to all concerts start at $29. The Master Chorale also offers $10 student tickets at the box office two hours prior to the performance, subject to availability. The Walt Disney Concert Hall is located at 111 S. Grand Ave.
For information and tickets, visit lamasterchorale.org, or call (213)972-7282.